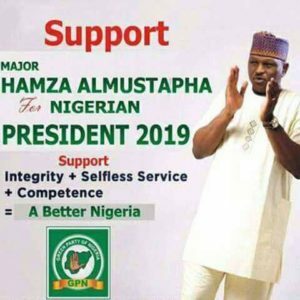 Retired Major Hamza Al-Mustapha, who served as late General Sani Abacha’s dreaded Chief Security Officer (CSO) in the ‘90s, has announced that if it is the wishes of the people, he’ll run for the office of president of Nigeria in 2019. “I am not going to announce myself contesting for a presidential seat, but if people say so, that is the wishes of the people”, Al-Mustapha said in an interview conducted in Kaduna, shortly after a meeting with the Leaders Eagle Eye Forum, a group begging him to throw his hat into the presidential ring come 2019. Al Mustapha added that: “I am not a power tasty person. If I am, I would have lost my personality long before now, but when people gather to speak and the decision is by them, then it is a call to serve”. Presidential campaign posters of Al-Mustapha first hit the streets of Abuja in 2017.